General John Stark Scenic Byway in New Hampshire - Who was John Stark? Born on August 28, 1728, Stark was the second son of Scottish immigrant parents in Londonderry, New Hampshire, but lived from the age of eight in Manchester (then called Derryfield). In 1752 he was captured by the Abenaki when hunting and trapping along the Pemigewasset River. He was taken to Canada where he remained captive until a ransom was paid. General Stark was first commissioned as a second Lieutenant in Rogers' Rangers at the outbreak of the French and Indian Wars, and gained valuable experience that later led to his leadership in the Revolutionary War. Between the French and Indian Wars and the Revolutionary War, General Stark spent a considerable amount of time at the Page homestead in Dunbarton, and married Elizabeth "Molly" Page on August 20, 1758. 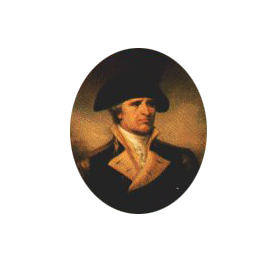 General Stark became colonel in the New Hampshire Militia four days after the Battles of Lexington and Concord, and was given command of the First New Hampshire Regiment. 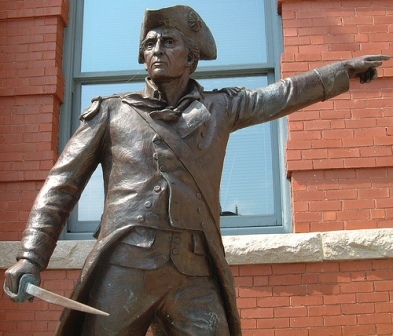 He was instrumental in leading the fight at the Battle of Bunker Hill in 1775 and the Battle of Bennington in 1777. Stark was Major General in command of the Northern Department of the Continental Army during the latter years of the war. His participation ended for a while after Bennington and Saratoga, but he was called back to take command of the whole Northern Department. In 1783, Stark was ordered to headquarters by George Washington, and given the personal thanks of the Commander-in-Chief, as well as the rank of Major General by brevet. After the war, Stark retired to his home in Derryfield. He and Molly had 10 children, 5 boys and 5 girls, one of whom died in infancy. He died on May 8, 1822 at the age of 93 and was buried in Manchester; it was said that he was the last surviving Continental general of the Revolution. General Stark's wife, Elizabeth "Molly" Page, was born February 16, 1737. Molly's childhood home was built by her father, Capt. Caleb Page, the first postmaster of New Hampshire. Her brother, Jeremiah Page, became a Supreme Court justice and delegate to the first Constitutional Convention in 1778. The Stark's eldest child, Caleb, who was born at her childhood home, was reportedly the youngest survivor of the Battle of Bunker Hill. A statue of Caleb stands in Dunbarton. Molly served as a nurse to her husband's troops during a smallpox epidemic and opened their home as a hospital during the war. She became famous in part for her husband's battle cry before the Battle of Bennington: "There are the Red Coats, and they are ours, or this night Molly Stark sleeps a widow!"